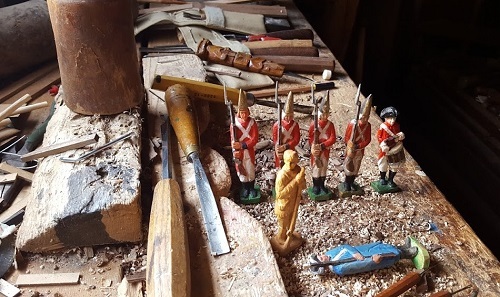 Battles with miniature soldiers set during the 18th century have been at the center of my interests since boyhood when I vividly recall my father, who was a wood carver, making wooden soldiers for me that were about four or five inches in height. One day, when I was 7 years old, he presented them to me with the very simple and prophetic instruction that “these are Redcoats and French musketeers from the French and Indian War and you could play with them and think about history.” Little did he know I was to be hooked for life. Over time I played many such games made possible by countless hours of making and painting miniature soldiers and have consequently developed a parallel interest in original sources of military writing by officers and theorists on tactics, strategy, and politics that was proliferating during the period. I have written my own game rules a number of times based on my reading. I have walked across battlefields in England, France, Germany, Austria, Italy, Poland, the Czech Republic, and Hungary. Still, it wasn’t enough, and I suppose it was inevitable that sooner or later this passion would lead me to develop my own iteration of the sculptures given to me by my Father by returning to the roots of it all which is to make in miniature the likeness of a soldier. To create the human form costumed in militaria with a style that invokes the right emotions and visions on the part of the beholder. 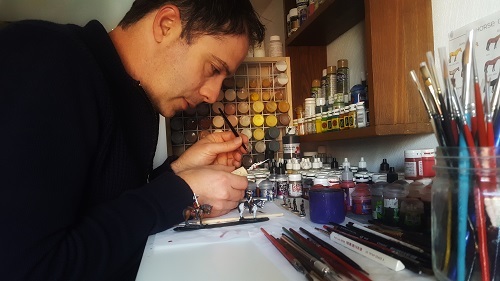 Venture Miniatures hopes to offer metal soldiers traditionally sculpted in a style inspired by period artwork and appropriate anatomy, and then cast in superior alloys, for the enthusiast of the 18th century.